Conventional economic theory states that interest rates raises by the central bank depress aggregate demand and inflation by making saving more attractive, prompting firms to lower their prices. According to the theory, all firms have perfect knowledge of the shocks which drive the economy. New research (e.g. Melosi 2017) shows, however, that an additional transmission channel may be present if firms have only incomplete information at their disposal, while the central bank is more fully informed. In this case, the private sector may also use the central bank’s interest rate decisions to become better informed about the prevailing situation regarding supply and demand conditions. Firms might, for example, interpret an unexpected increase in interest rates as an indicator that demand is increasing, prompting them to raise their prices, which in turn could lead to a temporary increase in both inflation and short-term inflation expectations. The strength of this signalling effect depends on the accuracy of the information available to the private sector, which is also reflected in the dispersion of inflation expectations, among other things. In a recent study, we take an empirical and theoretical approach to examine the extent to which the macroeconomic effects of US monetary policy change depending on how widely professional inflation forecasts differ from each other (Falck et al. 2017). This approach allows us to distinguish between the above-mentioned monetary policy transmission channels, which have contrasting effects on inflation and inflation expectations. We calculate the range of individual inflation forecasts using the Survey of Professional Forecasters. This survey has collated individual inflation forecasts for the US since 1968. The dashed line in Figure 1 shows strong variation in the dispersion of inflation expectations during the period from 1971 to 2015. To examine how changes in the heterogeneity of inflation expectations impact the macroeconomic effects of monetary policy, we use an empirical model which takes account of the probability of a high or low degree of variation in inflation forecasts. The solid line in Figure 1 illustrates the probability of inflation expectations differing widely from each other. We then estimate how inflation and other key macroeconomic variables respond to monetary policy decisions in scenarios where there are major or relatively minor differences in expectations. Our empirical study shows that inflation and inflation expectations respond differently to an unexpected increase in the policy rate, depending on the extent to which professional inflation forecasts issued at the time of the shock differ from each other. The key finding of our study is that, when professional forecasts are highly heterogeneous, an unexpected increase of one percentage point in the policy rate by the Federal Reserve leads to a 1 percentage point short-term increase in inflation, and a 0.5 percentage point increase in short-term inflation expectations (see Figure 2, first column). 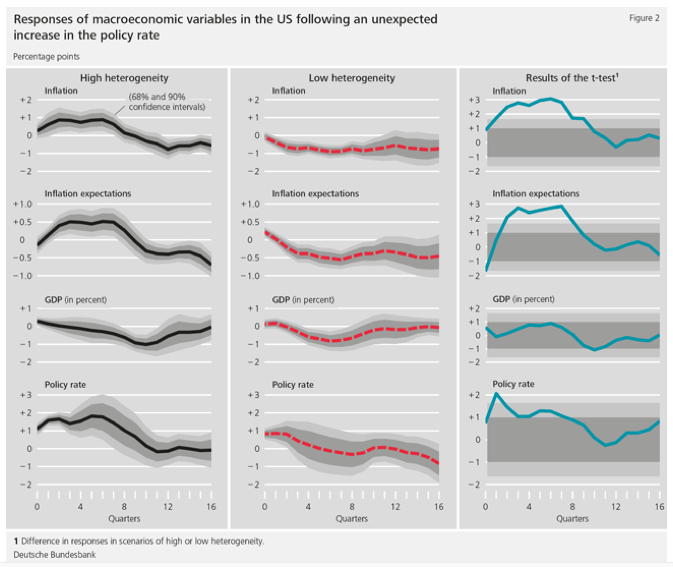 In periods where inflation expectations are less heterogeneous, the same, unexpected increase in the policy rate causes inflation and short-term inflation expectations to move in the opposite direction – they decline by 1.0 and 0.5 percentage point respectively (see Figure 2, second column). These marked differences are also highly statistically significant in the first two years, as can be seen from the last column of Figure 2. The reaction of GDP and the policy rate also points to different effects in terms of monetary policy. Although GDP declines irrespective of whether inflation forecasts are similar, economic output declines somewhat more sharply if professional inflation forecasts differ widely. The reaction of the policy rate is determined not only by the unexpected monetary shock, but also by the endogenous reaction of other variables such as inflation. High rates of inflation, in particular, induce central banks to raise their policy rate further. This estimated effect is more pronounced if the experts have widely differing inflation expectations. Our empirical findings are consistent with a theory which admits both more and less pronounced differences in inflation expectations. Following the study of Melosi (2017), we use a New Keynesian general equilibrium model. In order to account for disagreement about individual inflation forecasts, we assume that price-setting firms possess different information about the economy, with the result that their respective inflation forecasts differ. This is why firms pay close attention to central bank policy rates as a means of better understanding the state of the economy. This effect is more pronounced if the information available to firms differs widely. 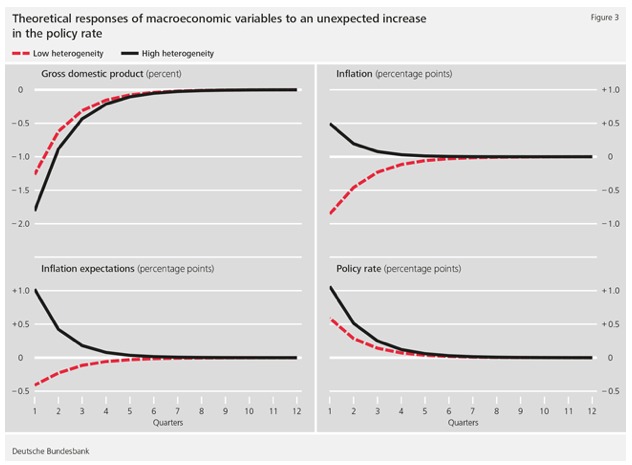 Figure 3 shows the theoretical effects of a monetary policy shock in the form of an unexpected increase in the policy rate in two different scenarios – one in which inflation expectations are weakly heterogeneous, and one in which they are highly heterogeneous. According to the model, the results are determined by both economic channels – the classical interest-rate channel, and the signalling effect. If the policy rate is raised, inflation and output decline as a consequence of the interest-rate channel, because households spend less and save more. This is consistent with the empirical findings in a scenario with low heterogeneity in inflation forecasts. If inflation expectations are highly heterogeneous, the wide disparity of information on the state of the economy available to firms will lead them to interpret an increase in the policy rate as the central bank’s response to lower productivity or higher demand, which are associated with an increase in firms’ marginal costs and price pressure. Firms therefore raise their prices, with the result that inflation and inflation expectations increase temporarily, until the monetary policy shock is recognised for what it is. In this scenario, therefore, the signalling effect temporarily outweighs the effect of the interest-rate channel. This matches the empirical findings in the scenario with widely differing inflation expectations. Although many central banks are currently pursuing unconventional monetary policies, it is important to have an accurate understanding of the effects of policy rate changes. This is particularly true at a time when the Federal Reserve has initiated a normalisation of monetary policy and has increased the range of its policy target rate. Other central banks could follow the Fed’s policy decision. Our study provides empirical and theoretical evidence that an increase in the policy rate can, in the short run, give rise to higher inflation and inflation expectations if professional inflation forecasts differ widely. The implication for central banks is that they should always keep an eye on the distribution of individual inflation forecasts when making monetary policy decisions. Falck, E, M Hoffmann and P Hürtgen (2017), “Disagreement and monetary policy“, Bundesbank Discussion Paper 29/2017. Melosi, L (2017), “Signalling effects of monetary policy”, Review of Economic Studies 84(2): 853-884.